Sailing on an Alaskan cruise? If so, then chances are high that you will be departing from Seattle. The city has become the main “jumping off” point for cruises to Alaska. And if you are sailing from Seattle, then it’s also likely that you will need a hotel the night before your cruise. While ports in other parts of the country are within driving distance of many cities, Seattle — situated on the West Coast — is pretty far from most major cities unless you happen to live in Seattle itself. That means many people decide to fly in for their trip. Should you want to fly in, it’s a good idea to arrive at least the day before your cruise departs. Not only is Seattle a wonderful city to visit, but if there are any delays such as weather or flight cancellations, you still have plenty of time to reach your ship. Of course, if you are flying in then you also need a place to stay. Seattle has no shortage of hotels near the cruise ports — Pier 66 and Pier 91. And with cruising being big business in the area, many hotels offer perks and incentives to attract cruise passengers. One of those perks is transportation to the cruise port. Stay a night, and they will offer a shuttle to your ship. Now, not every Seattle hotel offers shuttles to the cruise port. However, we’ve rounded up a number of them that do. If you need a ride to the port come cruise day, these are some good options. Looking for Seattle hotels with parking packages? Check this page. Click on the hotels listed below to be taken to reviews and pricing on TripAdvisor.com. For parking packages you may have to book through the hotel website, which is linked on TripAdvisor. Note: This article contains affiliate links. We earn a commission for clicks made on their website, at no charge to you. Enter your dates of stay on TripAdvisor using the link below for the most accurate pricing. If you want to stay in a great location near the cruise ports and all the cool things that Seattle has to offer, this hotel is a great option. It features a shuttle for $8 per person to the cruise terminals. You simply let them know when you check in. The schedule is flexible to meet your needs. The Travelodge offers (relatively) affordable accommodations near Seattle’s most iconic landmark — the Space Needle. They also offer a “Shuttle Service Seattle Cruise Package” that includes a room, breakfast, wi-fi, and a shuttle to and from the downtown cruise ship terminal (Pier 66). If you want to stay near downtown Seattle and have a shuttle to the port, this is one of your options. There is an $8 per person cruise shuttle to the port. At this location you are literally a couple of blocks from the Space Needle, so it’s hard to beat. An upscale hotel, the Pan Pacific is ideal for more affluent travelers and they do their best to cater to their needs. The hotel offers complimentary shuttle service to locations within two miles of the hotel. That’s definitely within reach of Pier 66, but Pier 91 is about three miles away. Still, if you inquire, you might be able to have them make an exception. There are also other deals, including one that offers $25 Uber credit — more than enough to get you to the cruise terminal. 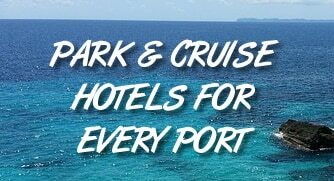 Offering a cruise shuttle package, the Warwick Hotel is a strong choice for before or after your cruise. The “No Ship!” package include a room, full breakfast, and one-way transportation to either Pier 66 or 91, depending on where you cruise from. Just be prepared, the high-end hotel can be a little pricey. The Crowne Plaza is in the heart of downtown Seattle and receive good traveler reviews on TripAdivsor. If you’re a cruise passenger, then you can book a shuttle through the concierge for $10 per person. It runs at 10:15, 11:15, 12:15 and 1:00. There is also a “Port of Seattle Cruise Package” that includes transportation and $25 per night parking while you are on your cruise. Finally, you can book transportation roundtrip from the airport for about $100. For those wanting to visit Seattle, the location of the Hyatt Place can’t be beat. Just a couple of blocks from the Space Needle, you’re in the heart of the city with lots of things to do. The hotel also offers complimentary shuttle service to Pier 66. Pier 91 passengers will need to book their own transport, or the hotel will do it for your at $10 per person. If you are flying into the area, then staying near the airport might be preferable. the DoubleTree offers pre- and post-cruise packages, that include accommodations and transportation between the airport, hotel, and cruise port. It makes it easy to fly in, stay a night and get to the ship (and back to the airport). This hotel is a perfect stop-off for those flying into Seattle. Similar to the DoubleTree listed above, it offers pre- and post-cruise packages that offer a room and transportation between the cruise port and the hotel, along with a shuttle from the airport. Unfortunately for budget travelers, there aren’t a ton of cheap hotels near the cruise ports (here’s our list of cheap Seattle hotels near the port). The Quality Inn represents one of the more affordable. It also offers a cruise port shuttle for $7 per person if headed to Pier 66 and $10 per person if headed to Pier 91.